Almost all time management/life management books tell you to make a list of values or priorities to help you plan and decide how you should spend your time. However, a list jotted on a day planner or printed out and tacked up somewhere is not very inspiring. So I decided to make mine into word art. The great thing about word art is that you don’t need to be all that creative. There are lots of online word cloud generators that do all the work for you – all you have to do is type in the word and it does the rest. Wordle is the most popular, but since it uses Java (which doesn’t work well with Chrome) I ended up using Word it Out. (For a quick run down of some of the different generators, visit Educemic.com). You can also enter a website address and it will pull out commonly used words. I have made a few for clients to help me focus on their values when coming up with marketing ideas. Once you have adjusted the options for fonts and colors, you end up with a piece of art that you can use as a screensaver or print out and post near your computer. Much more inspirational than a plain list of words! 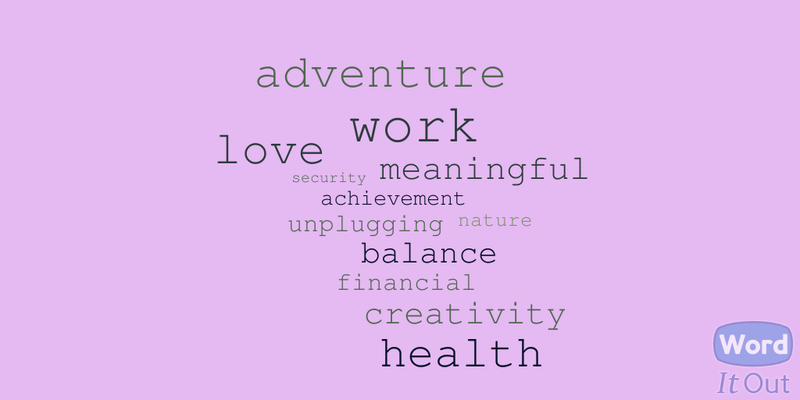 Do you have a creative way of displaying your list of priorities or values? I love word art, thank you so much for sharing the links. I’ll be checking them out. Very cool, Wendy! Thanks for sharing this! Wendy, this is so simple – it’s pure Genius! Thank you, thank you … and I’m off to check out WordItOut, too! I love using Wordle. They even have my kids use it at school to focus on the main idea of a story. I wrote a series of posts about using Infographics and some of the software available to make them. You can read more at my link above. thank you, I will check out your link!